We’d love your help. 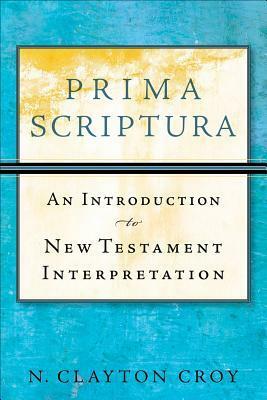 Let us know what’s wrong with this preview of Prima Scriptura by N. Clayton Croy. This introduction to New Testament exegesis proceeds from the preparation of the interpreter through analysis of the text to appropriation in the community. To ask other readers questions about Prima Scriptura, please sign up. Although I am not a Bible scholar, I did pick this book up after completing a Masters degree in Religion. I found it very helpful in learning how to read the New Testament in its proper context without having to go through all the process of learning 1st century Greek. I recommend this book to anyone wishing to engage in any real interpretation and insight into the gospels at an introductory level. If you are about the process of learning NT exegesis, you could choose no better and more balanced account. This is not a liberationist text, but evangelical and progressive (and progressive evangelical) interpreters will find much wealth here. This is best for readers who have elementary facility with NT Greek. Useful, helpful, exceptionally dry - all words that sum up this book. It is for all intents and purposes a text book and reads as such. It reminds me a lot of books I used in homiletics courses and does a good job at it. It its however not compelling reading.